There’s nothing new about videos of Myanmar Buddhist monks behaving badly. In fact bad-boy monk Ashin Wirathu, known as ‘the Burmese bin Laden’, has even appeared on a cover of Time with the title ‘the face of Buddhist terror’ for his calls to remove every Rohingya from Myanmar. The foul-mouthed Myanmar Buddhist monk also called Yanghee Lee, UN special rapporteur on the situation of human rights in Myanmar, a “whore”, before a cheering group of followers in Yangon. However, from this video above it would appear that helpless Rohingya and/ or women are not the only people Myanmar Buddhist monks dislike; they dislike each other also. Forget all that talk about shared bonds of fraternity; forget also the Lord Buddha’s teachings of humbleness and Samma kammanta (right conduct or right action). 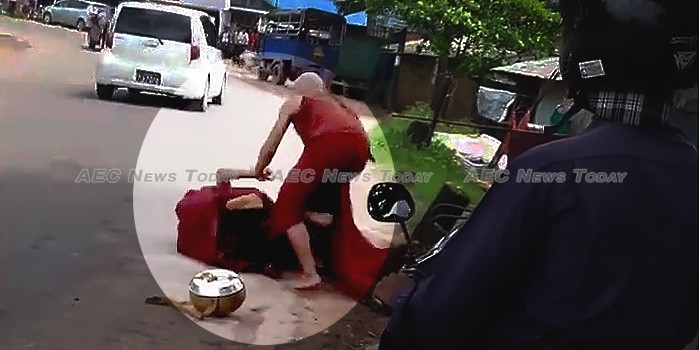 The video above is said to have been taken on a road in Yangon, Myanmar, and shows why the reputation of Myanmar Buddhist monks is what is internationally. The clip begins with the two monks walking along the side of the road having a heated verbal altercation (probably the reason why the person started filming). As the two Myanmar Buddhist monks pass the videographer, one hits the other over the head and shoulders with his umbrella — twice. The situation then descends into a full-on melee, with begging bowls dropped, and one monk being pushed onto his back on the road. People stand mesmerised by the brawling monks, a group of students seen about 50 metres beyond. Cars blow their horns — whether in an attempt to stop the fight or to provide encouragement is unknown. One of the monk’s scoops up the food container of the other and attempts to make away with it. The older Myanmar Buddhist monk is having none of that however, and grabs his fellow monk by the arm. Robes fall to the ground, voices are raised and there’s not a sign of enlightenment anywhere. After pulling free, the younger of the two Myanmar Buddhist monks collects his robes from the roadway, and dresses, all the while not taking his eyes off the other, before proceeding on his way, while the older of the two monks likewise collects his robes from the dusty roadside, dresses, and walks back in the direction the two had just come.